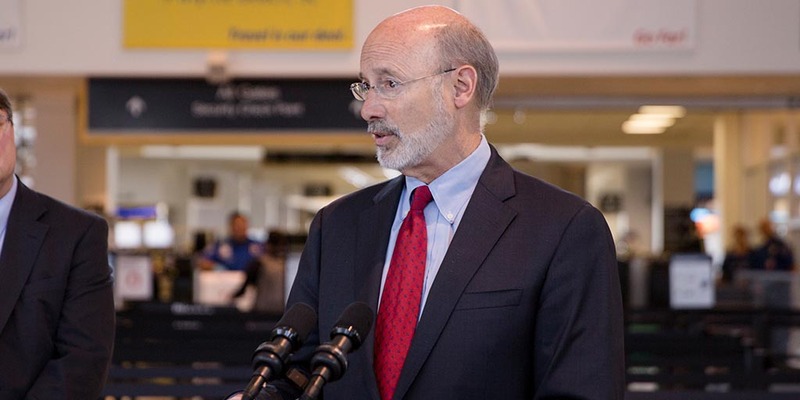 Harrisburg, PA – Fourteen airports will make safety upgrades or expand operation opportunities with the assistance of $15 million in state investments, Governor Wolf announced today. Seventeen projects will be supported by $9.8 million through the state’s Aviation Transportation Assistance Program, and $5.2 million through the aviation portion of the Multimodal Fund created by Act 89. Allegheny County Airport — $888,000 of state funds for a total project cost of $1.2 million for restoration and improvements to the terminal building. Altoona-Blair County Airport — $1.1 million of state funds for a total project of $2.2 million to demolish and construct a new county building at the airport and $1.5 million of state funds for a total project cost of $3 million for a new corporate hangar. Quakertown Airport — $270,000 of state funds for a total project of $540,000 to acquire land to clear approaches to Runway 29. Chester County/G.O. Carlson Airport — $337,000 of state funds for a total project of $674,000 for a new hangar apron and $513,000 of state funds for a total project of $1 million for new hangar facilities. Erie International Airport/Tom Ridge Field — $1.7 million of state funds for a total project of $2.3 million for rehabilitation of the terminal building. Wilkes-Barre/Scranton International Airport — $147,500 of state funds for a total project of $295,000 for relocating a TSA checkpoint to reduce queues. New Castle Municipal Airport — $375,000 of state funds for a total project of $500,000 for land acquisition to control development around the airport. Williamsport Regional Airport — $150,000 of state funds for a total project cost of $300,000 to replace hangar doors. Pocono Mountains Municipal Airport– $800,000 of state funds for a total project of $1.6 million to construct T-hangars. Washington County Airport — $1.3 million of state funds for a total project of $1.7 million for a new taxiway and $700,000 of state funds for a total project of $933,000 for a second section of taxiway. Pittsburgh International Airport — $1.6 million of state funds for a total project of $2.2 million for airfield pavement joint crack rehabilitation. University Park Airport — $2.2 million of state funds for a total project of $5.4 million for an access road to the airport. Lancaster Airport — $691,150 of state funds for a total project of $921,534 for a new aircraft maintenance hangar and office. Lehigh Valley International Airport — $700,000 of state funds for a total project cost of $1.4 million to rehabilitate a parking lot.